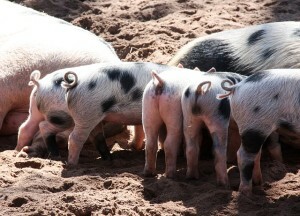 A 4-year project of “Strategies to reduce the risk of tail biting in pigs managed on slatted floors” has started. It is a collaboration between Teagasc, SRUC and the University of Edinburgh. 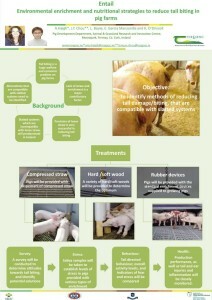 Below is a poster on the project presented in the Teagasc Pig Farmers’ Conference 2015. The project will aim to explore ways to reduce tail-biting on slatted floor systems where straw is not available by environmental enrichment and nutritional strategies. The enrichments used at the moment are compressed straw and different wood types. Later the project will also investigate the effects of various lengths of tails, measures to predict tail-biting outbreaks and methods to interfere effectively. The project will be supervised by Dr Keelin O’Driscoll (Teagasc), Dr Rick D’Eath (SRUC), Dr Dale Sandercock (SRUC), and Prof Natalie Waran (University of Edinburgh). Dr Amy Haigh is the postdoctoral researcher working together on this project in Teagasc, and Dr Laura Boyle and Dr Edgar Garcia Manzanilla are also the collaborating researchers in Teagasc. I (Jen-Yun) am the PhD student on this project. Description are provided by the Actions directly via e-COST. The GroupHouseNet aim is to provide the European livestock industry with innovations in breeding and management for pigs and poultry that are needed for a successful transition to large group housing systems without necessitating painful tail docking and beak trimming. Allowing the animals greater opportunities to display their species-specific behaviour while avoiding the routine use of painful procedures, group housing of unmutilated animals sits at the core of the new animal welfare paradigm driven by consumer demand. Group housing is associated with increased risks of damaging behaviours among the animals, such as feather pecking, aggression and cannibalism in laying hens and tail biting, bellynosing, excessive aggression and cannibalism in pigs. Recent research suggests the key to reducing the incidence of these behaviours lies in refining and applying methods of genetic selection, and developing husbandry innovations that improve early and later life conditions – which is exactly what GroupHouseNet will use the COST Action framework and tools to do. GroupHouseNet brings together researchers and industrial partners dealing with animal breeding and genetics, animal nutrition, epidemiology, engineering, animal behaviour and welfare, epigenetics, immunology, (neuro)physiology, economics and ethics. To strengthen the scientific and technological basis in these areas the Action will facilitate knowledge sharing, creation and application in pigs and laying hens in both experimental and commercial environments. The activities will be conducted in an open, output-oriented transnational, multisectorial, and multidisciplinary research and development network emphasising COST Excellence and Inclusiveness Policy. (action arising in part from the FareWellDock project). As a follow-up to the German tail biting research review, German federal research institutions are currently making arrangements for better cooperation and coordination of their tail biting research. Representatives agreed to update an existing lesion scoring format from 2011 in such a way that it can be used to score tail and ear lesions in basic research as well as on-farm projects. In addition, a web-based database for tail biting experiments and projects will be launched in 2016 in order to facilitate knowledge exchange. The database will be based at the Institute of Animal Welfare and Animal Husbandry (ITT) within the German Federal Research Institute for Animal Health (FLI). The German Federal Ministry of Food and Agriculture (BMEL) also recognised the great importance of tail biting and other pig topics, and granted a new permanent pig welfare research position at ITT for 2016.